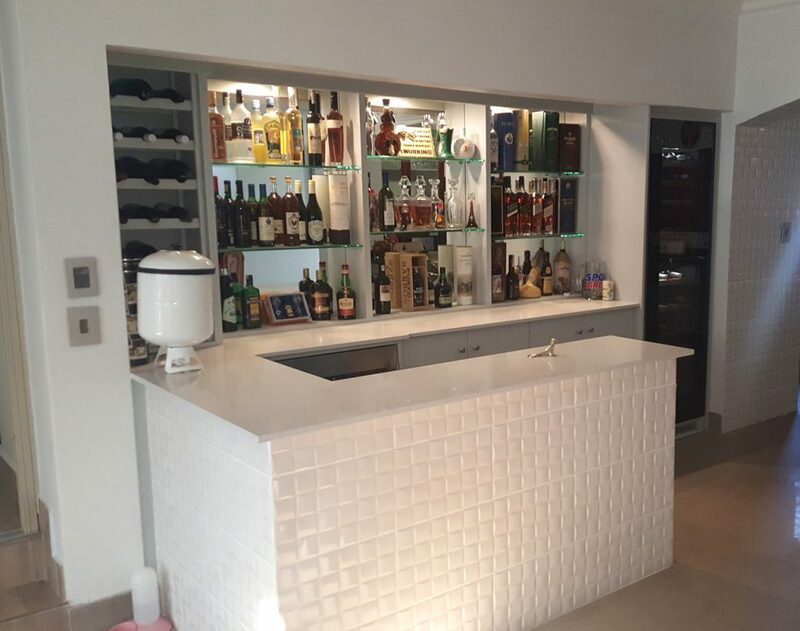 The Bar counter framework was made from MDF which was clad in the tiles chosen by the Client. The internal structure of the Bar was Duco finished to a Folkestone Grey colour to match the colour of the Cabinetry. The counter top and cupboard tops was created in Technistone Starlight White. The Cupboards at the rear were designed to accommodate the two Liebherr integrated Fridges. A Duco finished Cradle Wine rack was created to the left of the Displays . The doors for the Cupboards were Duco finished to match the colour of the interior of the Bar Counter. The displays above the cupboards had Silver mirrors, 10mm glass shelves and LED lighting.